This trip to Coba comes with a buffet dinner and your choice between two activities: a visit to Maya villages with a traditional ceramics class, or ziplining over the Coba Lagoon with a cenote swim. 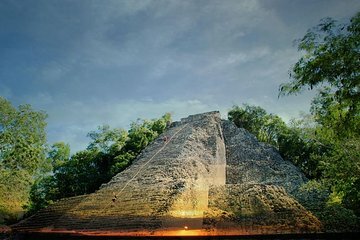 Before sunset, explore the archaeological site of Coba by bicycle on a 2-hour guided tour and climb Nohoch Mul, one of the region's tallest pyramids. Your dinner entertainment includes a live show of music, dance, theater, and a traditional Maya ball game. Bonus: Round-trip transport from Cancun and Riviera Maya hotels is included. After pickup from your Cancun or Riviera Maya hotel between 11:30am and 1:30pm, travel with your small group of up to 15 people for about two hours to Coba, an ancient Maya city on the Yucatan Peninsula. Upon arrival, hop on a bike for a 2-hour guided tour of the archaeological zone. Learn about the temples, winding stone pathways, and other landmarks. When you get to the top of Nohoch Mul, one of the region's tallest pyramids, take a selfie with the stunning view behind you. Then, you get to choose whether you’d like to stay indoors or go outdoors in exploring more of Maya culture. Select from one of the two activities described below: a visit to Maya villages with a ceramics class, or a ziplining adventure over a lagoon with a swim in a cenote. After your activity, settle in for a delicious buffet dinner, featuring regional specialties of lobster or chicken, rice, beans, pasta, sauces, fresh salad bread, and tortillas. Sip aguas frescas and wine, and for dessert, savor homemade flan. As you enjoy your meal, watch a live show with music and dancing, an authentic Maya ball game, and an acted scene from the sacred Maya book, the Popol Vuh. Your tour concludes with drop-off back at your hotel. Visit authentic Maya villages and learn about how the people of these traditional cultures craft everything, from plant-based medicine, to tortillas, to elaborate ceremonial costumes. See ancient clay-making techniques during a ceramics class, and make a piece of your own to take home as a souvenir. Fly 100 feet (30 meters) over the Coba Lagoon on the region's longest zipline of 1,680 feet (512 meters). After your adrenaline-filled trip, cool off by swimming in a cenote, an underground swimming hole with crystal-clear freshwater and hundreds of stalactites and stalagmites.